We had a session at the Zoo today and after a very busy first hour it quietened down considerably. Once we had the first few nets up we were inundated with Silvereyes with them almost queuing up to jump into the nets. A few of the early Silvereye rush. The weather at that stage was reasonable, with low sun and only a moderate Northerly wind blowing. As the morning progressed the sun of course got higher and affected some nets and the wind strength increased to near gale by midday.It was late morning before we could get more nets up but because these were in more exposed positions and with the increasing wind they were taken down early afternoon. Due to the wind we had all the nets down a couple of hours earlier than usual. Over 75% of birds were caught in the first 3 nets erected. There was a very good turn out of participants with a number of experienced banders able to help several newcomers. As well as banders we had Shannon from the Dept of Conservation documenting the session for bander training resource purposes. We caught a total of 77 birds of 6 species with 60 new and 17 recaptures. Numbers were up a little on last May when we caught 54. The biggest difference was almost twice as many new Silvereye today. Silvereye - 51 (10) two of the recaps were relatively old birds, 1 banded Jan 06 is the 2nd oldest at the Zoo the other banded May 06 is not far behind. Another bird was banded at Houghton Bay in March 11. Over the last couple of days I have done some banding both at my place and down the road at Bridie's. Didn't catch a lot of birds but at Bridie's did catch old White Eye again after an absence of several months. The bird was named by Bridie due to it having several white feathers on the side of its head and she keeps an eye out for it. She reported he had returned about a week ago and he will probably stay around now for the winter. He was banded on 8 Aug 04 and at 3207 days is the oldest Blackbird we have recaptured. There has been an older recovery of a dead bird and White Eye will have to go another year to match that age. This was the 20th time he has been caught and he appears to be in good condition with a weight of 96g which is near the top of his weight range. House Sparrow 5 (5) the oldest recap was banded Nov 11. The next Zoo banding session will be this Saturday 25 May and at this stage the forecast looks good so hope it stays that way. With rain forecast to start around lunch time I hoped to get a couple of hours banding in at the Houghton Bay stream this morning. The rain was a bit late so I managed a bit longer than 2 hours and although not a big catch there was still a steady flow of birds. Caught a total of 34 of 6 species with 27 new and 7 recaps. Greenfinch - 6 (1) the recap was banded in Feb this year. Silvereye - 10 (5) the oldest recap was banded at the Zoo in Aug 10, was recaptured at my place 2 days later and has now made it to Houghton Bay. The first 2 Silvereyes caught were cuddled up together in the net. I thought they might have been a pair but the were banded years apart so were probably just friends. Fantail - 1 (0) the first bird caught and although there were a lot about they made a bit of a mockery of my attempts to catch them. Grey Warbler - 5 (1) the recap was banded in April 11 and although not our oldest probably makes it into the top half dozen or so. I recently received a list of Ralph's Tui sightings at his place in Roseneath. Between Aug 07 and Oct 09 he and Mary colour banded 58 Tui and many continue to be seen regularly. All but 3 have been seen at least a month after banding, 37 were last seen between 30 and 1000 days, another 13 between 1000 and 2000 days and 1 has now made it past 2000 days which is very close to the maximum possible. In this last list there were 3 birds seen over 5 years since being banded. Ruth and I have just spent several days at an old homestead in a bay on Arapawa Is hence there has been no post or any banding for a while. We had an interesting time getting over there as a strong southerly wind blew up and the ferry was unable to dock at Picton. So after many attempts it chugged back to Wellington in a rather rough sea but we managed to get back across the next day. It was interesting to see the changes in bird life since I first went there about 35 years ago when the area was a recently abandoned farm. There has been a huge increase in Bellbird numbers and they now appear to outnumber Tui. Tomtits have also re-colonised in the area and are now seen regularly. Three of our group (Nikki, Sussie and Annette) have just returned from a week on Cuvier Island, helping mistnet Saddleback (tieke) for a transfer to Cape Sanctuary near Napier. At the start of 20th century N I Saddleback were extinct on the mainland and found on only one island - Hen Island. Cuvier Is was one of the first islands they were translocated to, in the 1960's and now has a very healthy population. 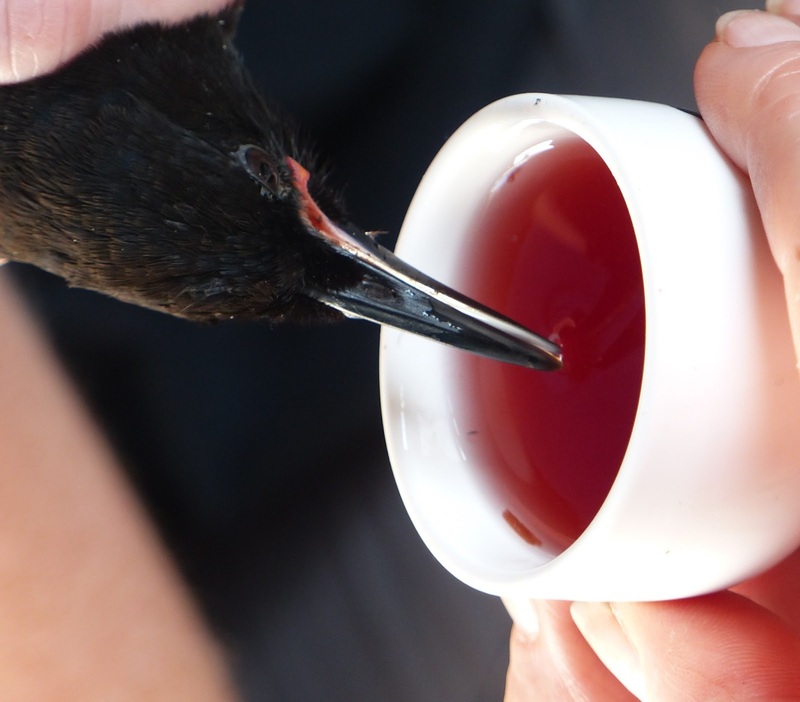 The plan was to transfer up to 120 birds over 2 weeks, but the Saddlebacks were so numerous and the weather so good that 120 birds were caught in three and a half catching days, and the whole operation was over in a week. They had great weather but it wouldn't have been so good the following week when there were gales and torrential rain. The birds were transferred by helicopter in 2 trips, but Annette and the others had to travel by boat. There is a steep track between the sea and the house where the lighthouse keeper used to live (which is now used for accommodation) and so the down side to this speedy conclusion was that after carrying gear and food up for 2 weeks, they then had to carry much of it down again although there was only half as much and the going was down hill. Surprisingly, although Saddlebacks are plentiful, there appeared to be quite low numbers of the other native species. Birds that are present such as Bellbird, Red Crowned Parakeet, Grey Warbler, Fantail and Morepork were few in number and there were only about a dozen birds caught as bycatch. There were some large flocks of Silvereyes, but even Blackbirds and Finches were comparatively scarce. The link below shows a video of the birds being released, great to see so many young folk involved. We had a banding session at the Karori Cemetery this morning and it was all black, well actual half of them were brown. We caught 10 new birds and 1 recap (actually 3 but 2 were banded earlier in the morning so don't count) all birds were blackbirds so a bit disappointing not to get a bit more variety. Hugh, Ros, Kate and Ross discussing the finer points of wing moult in female Blackbirds. I saw a brown/fawn Tui (Isabelline? Leucism? )in Jeypore St, Berhampore yesterday. It is in the same banksia tree as one of a similar colour was in last winter, there are about 15 banksia trees in the area each with a Tui or two in so I suspect this bird is probably the same one as last winter. It was a very overcast day but I did manage to get some photos even if they are a bit dull. I was able to get down to the Houghton Bay Stream for a couple of hours this morning and although I didn't catch a lot of birds I still consider it was a successful session. Managed to catch 24 birds of 6 species with 20 new and 4 recaps. Most of the birds were little fellows when, for the first time that I can recall, I used more AA bands than any other size. Also had a Morepork perched close to a couple of nets which I found while investigating Blackbirds giving loud alarm calls. They had obviously found it and woken it up from its daytime nap. Interestingly the nearest net did not catch any birds. The photo below was taken with my little pocket camera, the big one was at home keeping warm. Chaffinch - 3 (0) all were 1st year males. Grey Warbler - 6 (3) All the recaps were banded this year. So far this year 33 Grey Warblers have been banded at this site. For the whole of 2012 only 24 were banded, so it appears that they had a very successful breeding this last spring. The first bird caught a little Grey Warbler recap. While some of the Warblers have the red eye of adults some still have the browner eyes of younger birds with a couple still moulting tail feathers. Kate, Mary, Otis and I had a successful banding session at Island Bay this morning. We caught a total of 78 birds of 6 species with 74 new but only 4 recaptures. This compares with a total of 61 birds in a session this time last year. Blackbird - 6 (1) the majority of the birds were 1st year males. One of the 1st year male Blackbirds appeared to have moulted P5 which is a bit unusual. Chaffinch - 15 (0) this is the most Chaffinch we have ever caught at this site in 1 day. Mary, our chief scribe about to release the Fantail under the watchful eye of Ken,our host. As usual we had great hospitality with a superb morning feast as shown below.